Maria is a member of the Class of 2022. This is her first year on the Green Wave Gazette. Maria also enjoys participating in soccer, basketball, and track and field, as well as drama and Student Council. She enjoys writing about sports, and whatever else catches her attention. 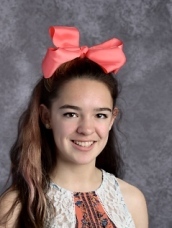 When she grows up, she would like to attend Boston University to pursue sportscasting for two reasons: to talk to her favorite athletes, and go to all of their games! She hopes you enjoy reading the Green Wave Gazette.